William Harrison Ainsworth (1805-1882), Novelist. Sitter in 10 portraits. William Black (1841-1898), Journalist and novelist. Sitter in 6 portraits. John Stuart Blackie (1809-1895), Classical scholar and teacher. Sitter in 14 portraits. Robert Browning (1812-1889), Poet; husband of Elizabeth Barrett Browning. Sitter in 53 portraits. Elihu Burritt (1810-1879), Philanthropist, linguist and social activist. Sitter in 2 portraits. Thomas Carlyle (1795-1881), Historian and essayist. Sitter associated with 83 portraits. (William) Wilkie Collins (1824-1889), Novelist. Sitter in 24 portraits. Cotton. Sitter in 1 portrait. Amelia Ann Blanford Edwards (1831-1892), Novelist and egyptologist. Sitter in 6 portraits. Ralph Waldo Emerson (1803-1882), American poet and philosopher. Sitter in 8 portraits. William Edward Forster (1818-1886), Industrialist, philanthropist and Liberal politician; MP for Bradford; son of William Forster. Sitter in 23 portraits. James Anthony Froude (1818-1894), Historian and editor of 'Fraser's Magazine'. 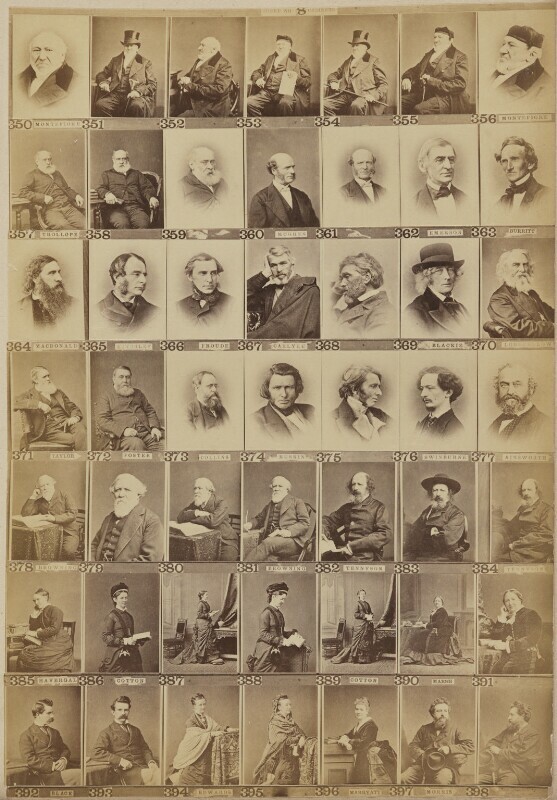 Sitter associated with 29 portraits. Frances Ridley Havergal (1836-1879), 'Sabrina' and 'Zoide'; poet and hymn writer. Sitter in 3 portraits. Thomas Hughes (1822-1896), Social reformer and children's writer. Sitter in 16 portraits. Charles Kingsley (1819-1875), Novelist, Church of England clergyman and controversialist. Sitter in 47 portraits. Henry Wadsworth Longfellow (1807-1882), American poet. Sitter in 21 portraits. George MacDonald (1824-1905), Poet and novelist. Sitter in 17 portraits. Florence Marryat (1837-1899), Novelist. Sitter in 3 portraits. Catherine Marsh (1818-1912), Philanthropist and writer. Sitter in 5 portraits. Sir Moses Haim Montefiore, 1st Bt (1784-1885), Financier, Jewish community leader and philanthropist. Sitter in 8 portraits. John Ruskin (1819-1900), Writer, artist and social reformer. Sitter associated with 82 portraits. Tom Taylor (1817-1880), Playwright, comic writer and editor of Punch. Sitter in 17 portraits. Anthony Trollope (1815-1882), Novelist. Sitter associated with 27 portraits.